There are a few different ways you can experience The Wake Camp on Table Rock Lake. From personal hourly coaching, half or full day excursions, to overnight camps, The Wake Camp is setup for your success on the water. Take a look at our different offerings below. We can also customize any of our experiences to fit your needs, just ask! Book one of our coaches by the hour and let us customize a training session especially for you. Let us know what you desire to learn and we will specialize the program for you and your skill-set. From basics to advanced concepts, we are excited to get on the water with you and master the wake. If you want more attention and time on the water, than a half or full day excursion is for you. Let us get out on the water and help you unlock your potential. These excursions are also great for groups of friends, family, or corporate outings. Contact us for special group rates. Take the weekend off and get away on beautiful Tablerock Lake in Branson, MO. Our all-inclusive camps are designed for a fun, challenging, and refreshing experience complete with coaching, lodging, meals, events, and more. Bring your friends or family along and get group discounts on your entire package. The Wake Camp is a watersports encounter at Table Rock Lake in Branson, MO like none other. Riders of all experience levels will find a safe, practical, and exciting way to advance their watersports skills. From the fundamentals to the most advanced tricks, The Wake Camp instructors are ready and willing to help you progress your confidence and abilities on the water. We are here for you with hourly coaching, half and full day excursions, and even our all-inclusive overnight camps for an exciting immersion into your water sports craving in some of the nicest waters in the mid-west. Let our coaches work with you from the basics to advanced techniques and get the most out of your wakeboard journey. 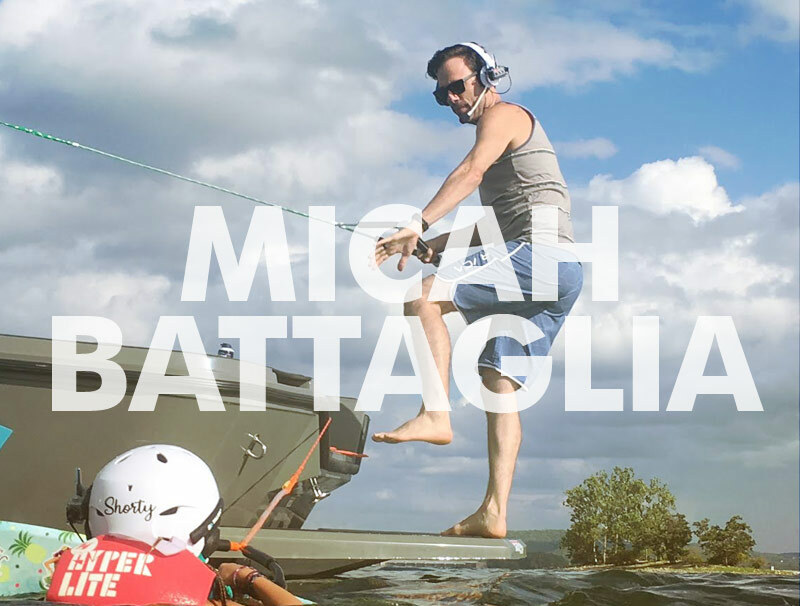 Micah grew up on the shores of Table Rock Lake but it wasn't until his teen years that his wakeboard journey began. After his first day of wakeboarding he was hooked. He and his friends took every opportunity to get on the water and ride, constantly pushing each other to new levels. They never had a coach or anyone to teach them so learning a new trick was always trial and error. After several years of competitions and over 20 years on the water Micah now shares his knowledge with riders of all levels, giving them the instruction that he never had. Jaysin has been boarding and training/coaching since the early 90s and his students have had great success; including 3 World Championships, 2 X Games Championships, World Cup, Gravity Games, Vans Triple Crown Champions to name a few. From 93-03 Jaysin was sponsored by CWB and rode with some of the best riders in the world. Jaysin also brings experience working at multiple board schools across Florida. Thank you! We will get back to you as soon as we can. Looking forward to talking with you. © The Wake Camp 2018 | Site design by Evan Hoffpauir.